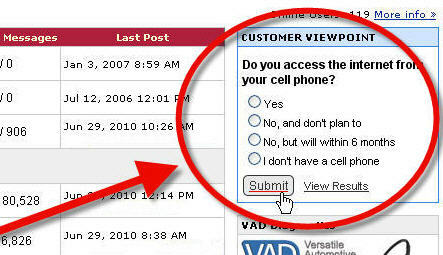 WORLDPAC Industry News "WIN": Introducing CUSTOMER VIEWPOINT Poll Questions! Introducing CUSTOMER VIEWPOINT Poll Questions! Introducing the CUSTOMER VIEWPOINT – a new opinion poll area located within the Community Forum pages of speedDIAL, WORLDPAC's electronic catalog and order fulfillment system! CUSTOMER VIEWPOINT allows WORLDPAC customers to share opinions about specific automotive industry topics, WORLDPAC, products and services, and more. Your response will help us better serve your needs in the future. Visit speedDIAL's Community Forums today and let your opinion be known!